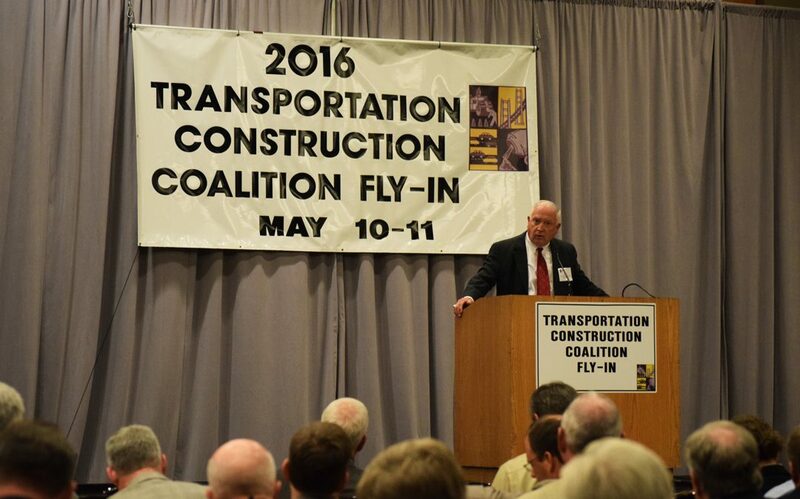 Pictured, ARTBA President & CEO Pete Ruane speaks at the 2016 Transportation Construction Coalition (TCC) Fly-In. A combined 400 transportation construction professionals came to the Nation’s Capital May 9-11 to learn the latest about federal highway, transit and aviation infrastructure funding issues and to meet with members of Congress during the annual ARTBA Federal Issues Program (FIP) and Transportation Construction Coalition (TCC) Fly-In. The FIP featured ARTBA division, committee and council meetings and the semi-annual gathering of the association’s Board of Directors, presided over by 2016 Chairman David Zachry. The ARTBA Foundation’s Awards Luncheon featured the presentation of the George S. Bartlett Award and Helping Hand Awards. Meeting attendees got a behind-the-scenes glimpse of last year’s passage of the FAST Act, the five-year surface transportation program reauthorization, from a panel of key congressional staffers. ARTBA President & CEO Pete Ruane reminded attendees that more work remains to be done regarding transportation construction investment, especially finding a sustainable revenue source for the Highway Trust Fund (HTF). During meetings with members of Congress, attendees continued to push for a permanent HTF funding solution, passage of an aviation bill that increases investment in airport construction projects, and full highway/public transit investment levels in FY 2017 as called for in the FAST Act. Several members of Congress addressed TCC participants. Carper, a member of the Senate Finance and Environment & Public Works Committees, voted against the FAST Act. He said the law relied too much on revenue “gimmicks” such as dipping into Federal Reserve accounts and selling oil from the Strategic Petroleum Reserve. “It was crazy stuff. It was a debacle. We walked away from our responsibilities,” Carper said. Rep. Jim Renacci (R-Ohio), who also voted against FAST Act, urged fly-in attendees to push their members of Congress on the need to increase user fees to pay for transportation construction and maintenance. Renacci said new revenue is most likely to come through tax reform. FAST Act supporter Rep. Sam Graves (R-Mo.) also said a long-term HTF solution should be addressed in a broad tax reform package. Such legislative packages have been used in the past to provide HTF revenue enhancements. Graves is gathering signatures from his congressional colleagues for a letter emphasizing the need to fix the HTF as part of a tax reform plan scheduled to be unveiled in June. The letter will be sent to House Ways & Means Committee Chairman Kevin Brady (R-Texas) and Ranking Member Rep. Sander Levin (D-Mich.). Members of ARTBA and other associations are urged to ask their members of Congress to sign Graves’ letter.